On the surface Samplitude Pro X3 Suite looks very similar to version X2 but on closer inspection there are a multitude of new elements to this leading DAW! Pop Drums include an authentic mix of electronic and acoustic drum sets. 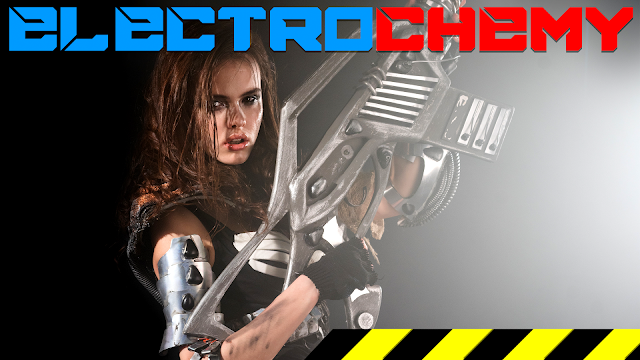 Lay down a powerful foundation for music in genres from New Wave and Pop to Rock and EDM. This software instrument is based on an authentically sampled Venetian church organ. A huge range of options for sound manipulation expand the repertoire of these instruments even further. They're perfect for use in rock ballads, hip hop tracks and modern dance productions. Due to popular request, DDP export is now also included in Samplitude. In addition to physical mastering, you can transfer data digitally with checksum. This guarantees a smooth pressing process. The new preview plug-in enables you to preview results before export and guarantees outstanding sound for your mix. Work on pitch to do away with muffled sounds of compressed formats or factor in features from various encoders to create masters compatible with iTunes and other music platforms. Comprehensive functions in the areas of editing and mastering make SOUND FORGE Pro 11 the perfect companion plug-in for Samplitude Pro X3 Suite. The powerful Audio Editor works on a precise, sample-based level and offers an excellent selection of tools for mixing and finalizing music productions. Then there’s Celemony's Melodyne Essential that is an audio editor that can correct pitch and timing. There are more new components to Samplitude Pro X3 but I have just listed the major ones above. You may or may not know, but MAGIX have recently acquired Sony’s Creative Software that includes Sound Forge! It will be interesting to see where MAGIX will take Sound Forge in the not too distant future! What’s a little odd is that MAGIX has retained the “Object Synths” in the form of the Loop Designer (beat and bass machine); BeatBox 2 Plus and Robota. These instruments aren’t bad - far from it! However, the Loop Designer is still not able to handle any sample drum loop in the WAV file format. By now, one should be able to drop just about any WAV file on the Loop Designer and it’ll automatically be rearranged for mangling! It’s not a disaster as there are dedicated instruments and effects from VST creators such as Sugar Bytes. The Looperator (Sugar Bytes) is the Loop Designer concept taken to the extremes! That said, the Loop Designer is great for knocking out quick beats and basslines! 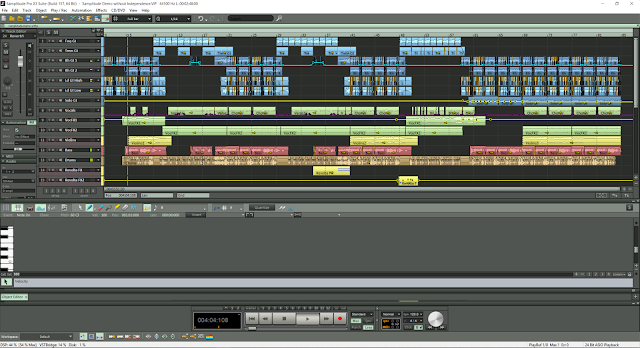 I am pleased to let you know that MAGIX has fixed the glitch that stopped the Loop Designer from looping correctly. I found Samplitude Pro X3 Suite to be just as easy to use as the last version - more so because the elements such as the Loop Designer being able to loop correctly upon playback have been fixed. MAGIX has certainly tightened up the loose screws here. At last it is possible to add tempo changes upon audio as well as MIDI! Awesome! It is about time - pun intended! It’s so very easy to navigate through the user interface as I have gotten used it over the years. And it is also so very easy to get a great sound with the Brickwall Limiter, sMax11, Analog Modelling Suite, Multiband Enhancer and EQ116 - all included in the Suite version. As you would expect, I have a host of mastering plug-ins that can also help me achieve a good mix with Samplitude Pro X3 Suite; it is amazing what you can get for free these days! Samplitude Pro X3 Suite is what I would call a studio oriented DAW; it is solid and will work with most hardware. I don’t have a studio as such as I am a computer musician and SAM Pro X3 easily fulfills my needs. 01. Music Maker (Premium) does not work with VST instruments that require separate output such as a drum synth. So, if you have purchased a VST could benefit from having multiple channels then I would say “go for it”! 02. If your computer music focuses upon sample loops mainly then I don’t see the point of advising you to step up in such a major way. SAM Pro X3 Suite is the mothership! 03. Is it worth stepping up from another DAW such as Sonar? Yes, I would say so without a doubt. You are getting a superb DAW with a plethora of instruments - including Independence with a 70GB library - and top-notch studio effects. The DAW cat amongst the pigeons is Cockos REAPER! I think REAPER slays a lot of the current DAWs currently on the market. REAPER pretty much matches most DAWs in terms of features; new features are added through regular updates. And if that’s not enough, you can run REAPER from a USB stick! However, SAM Pro X3 Suite holds its own against REAPER. Why? If you were to purchase the commercial license for REAPER it’ll cost you $225, that’s £176 (by today’s currency conversion) and by the time you have laid out for additional instruments and effects it could be that you’d have spent more than the asking price of SAM Pro X3 Suite, currently £449.99. Plus you get Sound Forge Pro 11 and that is worth $299 (£234) on its own! Certainly, if you were about to set-up a decent home or commercial studio I would recommend Samplitude Pro X3 Suite any day of the week! With a decked out PC setup, Samplitude Pro X3 Suite could go out on the road. 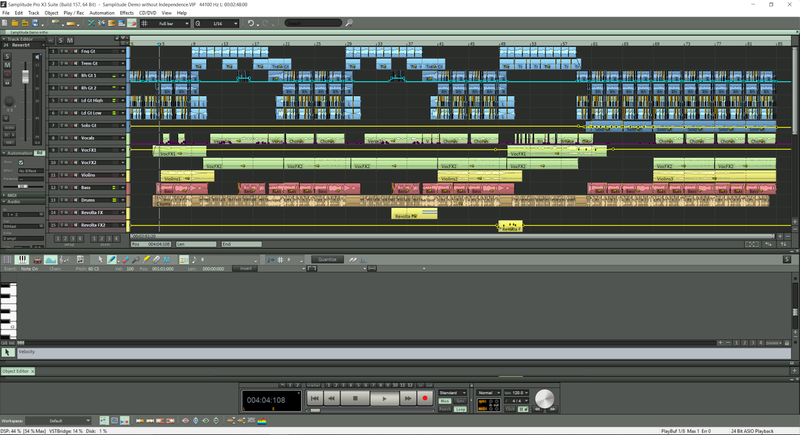 I have reviewed a lot of DAWs in my time and I have to say that MAGIX Samplitude Pro X3 Suite gives you a myriad of features for the outlay; it’s complete! It doesn’t try to be anything else but a workhorse of a DAW. I can’t say that I’m an Ableton Live fan. Samplitude Pro X3 Suite just works how I once worked in a physical studio. Now that Synapse Audio have discontinued Orion Studio my DAW of choice is Samplitude Pro X3 Suite. What I liked about Orion Studio was that it had a lot of power wrapped in a very easy to use interface; it was just lacking a little when it came to the composition side of things. Orion Studio was like FL Studio with its pattern based way of composition. In contrast, SAM Pro X3 Suite uses the traditional linear method of composition and that makes it fluid for me to sequence my music together. I have yet to see a DAW beat Samplitude Pro X3 Suite hands down for such an awesome graphical user interface - it is so precise! MAGIX Samplitude Pro X3 Suite scores a well-deserved Electrochemy Platinum!